1 und – CD com software, drivers e exemplos em C, BASIC e Pascal. Documentação impressa, que inclui: Manual EasyPIC for PIC, esquemático, Manual mikroProg , e o Guia Rápido para instalar os drivers USB. EasyPIC v7 is the seventh generation of our famous PIC development board. It is the product of accumulated knowledge over the past 10 years, and it’s state of the art of design, functionality and quality. It is loved by beginners and hobbyists, as well as professionals, and used in education and development by thousands. Board comes with PIC18F45K22 device. 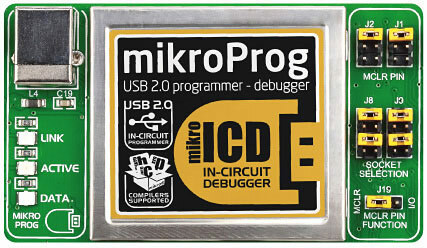 mikroProg is a fast USB 2.0 programmer with mikroICD hardware In-Circuit Debugger. Smart engineering allows mikroProg to support PIC10, PIC12, PIC16F, PIC16 Enhanced, PIC18F, PIC18FJ and PIC18FK devices in a single programmer! It supports over 387 microcontrollers from Microchip. Outstanding performance and easy operation are among it’s top features. The mikroICD debugger enables you to execute your program on the host PIC microcontroller and view variable values, Special Function Registers (SFR), RAM, CODE and EEPROM memory along with the code execution on hardware. Whether you are a beginner, or a professional, this powerful tool with convenient set of commands will enable you to track down bugs quickly. mikroICD is one of the fastest, and most reliable debugging tools on the market. ICD2 connector enables users to work with other programmers. It’s back! 4 digit 7 segment display is now a part of EasyPIC v7. Another row of PORT headers available on the left side. Connectivity at its best.